Chynna Laird's Lily Wolf Words: Food For Thought: Pita Pizza! Food For Thought: Pita Pizza! Well, this would be the third time I've posted awesome pizza recipes. Next to hotdogs (ew), pizza is one of my kids' favorite fun foods. So I try my best to put a healthier twist on their fun foods that not only appeal to their taste buds, but eases my mommy-guilt of giving them 'junk food'. So far, we've shared our original homemade pizza, which I turned to when I stopped buying the heavily processed, greasy and overly-salty frozen boxed stuff. And, let's face it. The stuff you get for take-out or order-in isn't exactly on the healthy side either. Then, I shared a wonderful recipe for pepper pizza, which uses sweet peppers as the 'crust' with all the regular fixings. Surprisingly, even my son, who can be a very fussy eater, loved these. 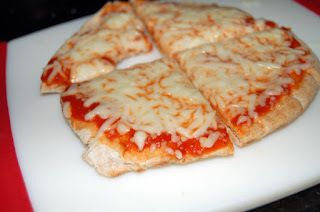 Today we are sharing another version of pizza: pita pizza. These are fast, easy and kids love to put them together themselves. We tried these using organic Greek pitas, but you could also use the whole wheat or multi grain versions to get a bit of extra fiber. I chose the Greek ones because they have a little extra boost of protein, which I am always looking for. You could even make your own pitas, if you are ambitious. The key is offering a nice variety of toppings that they'd be willing to give things a try. Have fun and let me know if these go off well in your family. ~ Pre-heat oven to *350. ~ Shred cheese, set aside. ~ Place toppings out for the kids to pick, choose and pile on what they want to try. We usually have onions, olives, tomatoes, some kind of green (eg: spinach, herbs, arugula, etc. ), feta, meat (we usually use leftover cooked meat because I don't like using processed packaged meat, but it can be easiest in a crunch). My kids have even gotten into snooping through my spice rack and choosing different spices and herbs to the mix. ~ Gently grease a few cookie sheets. Get the kids to choose their pita, put it on the cookie sheet for prep (this step is easier for counter clean-up purposes), then start with adding the sauce of their choice as the base. ~ I usually put toppings on first then the cheese but it's a preference thing. I have one kid that likes veggies under the cheese, then puts meat on last. Another that puts cheese first, then everything on top. Like I said, anything goes. ~ Once their pizzas are done to their specifications, place them in the oven for about 10 - 15 minutes. (My oven seems to cook things faster so I usually peek in on them at around 10 minutes, but it all depends on your oven and the toppings that the kids pile on). ~ Let the pizzas cool for a few minutes before cutting into them. For vegetarian or vegan versions, substitute the cheese with vegan versions as well as the meats, and add on protein-enriched ingredients.